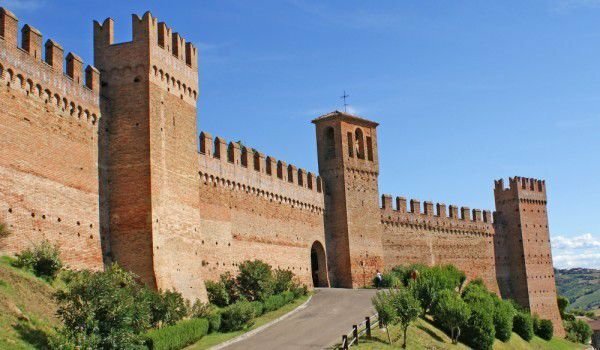 The Castle of Gradara is located in central Italy on the border between Marche and Emiglia Romagna. Not accidentally called the capital of the Middle Ages, Gradara was an important arena of political and courtly intrigue, crossroads of interests, trade and culture. Nowadays, the castle and fortifications have been recognized as one of the most beautifully preserved medieval centers in Italy, where visitors can immerse themselves in an ancient atmosphere, enjoying the incredible view. Gradara stands as a picturesque green island between the hills, rising to 142 m altitude, where you can feel the salty sea breeze coming from the Adriatic Sea, situated just 3 km from the fort. Walking along the jagged walls, 800 meters long, surrounded by greenery, our gaze falls on the vast blue sea and passing through the drawbridge, we come to the elegant courtyard in the center of which is an ancient well. Head to the courtyard inside the castle and an experienced guide will show us the room for torture dungeon, medieval kitchen, rooms for servants and watchmen and the armory with authentic weapons and armor from the Middle Ages. Climbing up a fine staircase, decorated with frescoes, we arrive at a small ballroom and the chambers of the rulers of the inhabitants of the castle. A major lady in the castle’s history was Lucrezia Borgia, which remains in history, on the one hand, as patron of culture and science, and the other, a femme fatale, the Goddess of love adventures, some of which ended fatally for her lovers. Legend and history intertwine in this enchanting place to tell us about the tragic love between Paolo and Francesca, sung by Dante, Petrarch, and Bokacho D'Anuntsio. Story of two lovers who died because of the passion that burned between them. The young Francesca fell in love with Paolo Malatesta, brother of Giovanni Malatesta, to whom she was married by fraud. With repulsive appearance and cruel nature, he surprised the two lovers and kills them on the spot with his piercing sword. And now the legend of their love, wrapped in mysticism, attracts and inspires love that the days of Valentine's Day, come to dedicate a week to love.